Adventures of Tintin is the all new game where one of the most iconic characters in animation returns for one of his most encapsulating adventures to date. The game itself features brilliantly innovative graphics as well as one of the most complex game play engines I have ever seen. The only downfall to the game is that its story line does become a little bit boring after a while and could have really been made much better if the truth be told. 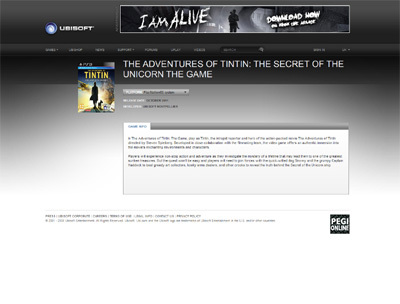 We have also compiled a Review System for this, of which Adventures of Tintin is Rated as Three Stars, the third highest possible score available from the Game Review Team.